Are you feeling lost in your workout? You do not know what to do once you walk into the gym? Activ Trax is the answer! 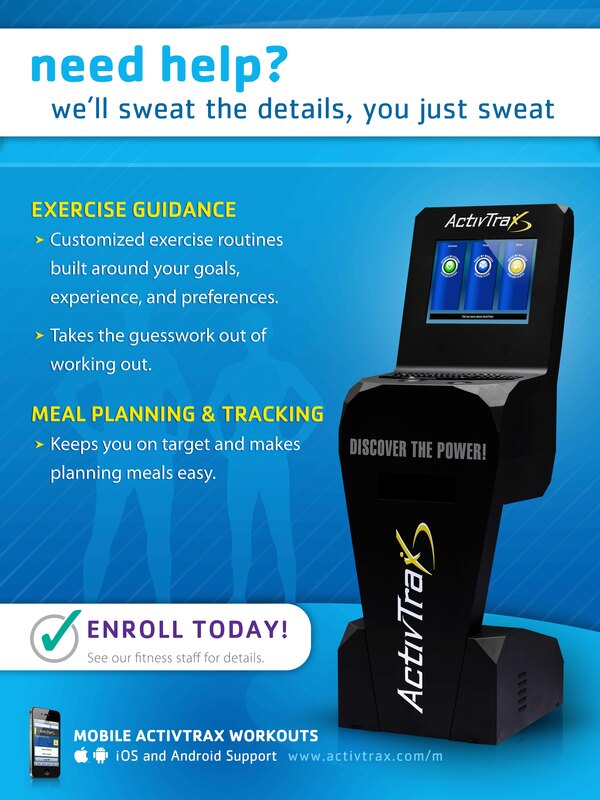 Activ Trax is a tool that creates customized workouts around your specific goals, strength and fitness experience. Each time you visit the Y, you will receive a new and customized workout that tells you exactly what you need to do to get in shape. How does Activ Trax work? Getting started with Activ Trax is easy. Once you have scheduled your appointment with the YMCA front desk staff you will be given a strength test by a trained YMCA fitness staff member. Use the kiosk conveniently located in the YMCA fitness center or log-on to activtrax.com to enter your results online from any web-based computer or smartphone. Everytime you finish a workout, just enter what you did online. ActivTrax automatically creates your next workout. All you have to do is hit "Print." It's easy, it's fun and it's free! Speak with the Y's fitness staff to learn more about ActivTrax and sign up TODAY! Print out your enrollment form and submit to a Y Welcome Center staff person today.